H. S. Abbott: Surfing in Australia, 1913. Abbott, H. S.: Surfing in Australia. Warner, P.F. (editor): The Boy's Own Book of of Outdoor Games and Pastimes. 4 Bouverie Street and 65 St. Pauls Churchyard E.C., 1913. This extract provided by Joe Tabler at Surfbooks.com, with many thanks. From the context, the author appears to be an English visitor to Australia- in particular note the reference to the lack of bathing machines in the final paragraph. It is possible that Abbott's observations were augmented by a number of previously published articles promoting the Australian beach-side. The Red Funnel, Dunedin, New Zealand.Volume VI, Number 3, April 1908, pages 268 to 271. The Lone Hand, January 1, 1910. Some of Abbott's observations are questionable. "In the summer there are as many people in the water in the night-time as in the day." - page 180. Note that night swimming is not reported by other contemporary commentators. It is possible that H.S. Abbott either accompanied or consulted William Henry, the Chief Secretary and founder of the Royal Life Saving Society in England in the 1890s, who toured Australia and New Zealand at the end of 1910. The connection is admittedly slight- Abbott's chapter is immeditely followed in the book by an article by Henry, Practical Lessons in Life Saving, pages 181 to 18? North Steyne, Manly, 22nd October 1910. Probably the most delightful and invigorating pastime in Australia is surfing, that is sea-bathing. In a very hot climate such as that of Australia, this kind or sport is well patronised by both sexes and all classes. No wonder the Australian lad is such a splendid swimmer; and Australia should be proud of such men as Cecil Healey, Beaupaire, and Hardwick, of whom most English boys will have heard. There is a little town about nine miles from Sydney in New South Wales which is a great resort for surf bathers, and every morning one can find hundreds of bathers enjoying their "morning surf." This Iittle place is called Manly; it owns a beautiful long wide beach or soft sand, and the waves break about two hundred yards from the water's edge. One of the great items of sport is "shooting the breakers," that is to swim out to where the waves are breaking and turn with the wave when it breaks and let its force carry you in. This is a real pleasure to those who are expert, and it is quite suprising at what rate the waves will carry a person in. But there is an art in "shooting the breakers" and it is not every one who can catch a wave at the right moment. If the bather is a moment too late in reaching the crest of the wave, he is what is called "dumped," that is to say, he gets under the wave and is curled up like piece of paper, and if the sea is running high he will receive a severe knocking about. On the other hand, if the bather is a second too soon in getting on to the wave, he will simply catch the swell and not get the force of the breaker, and be left where he is. There is nothing more delightful in the water than to catch a good breaker at the right moment and be able to navigate oneself right up to the water's edge. Good breaker shooters can reach right up to the sand, having at the finish only mere ripple of water to carry themselves upon. fine, there is fun and sport galore. The ball is generally opened with a procession through the town in fancy dress and in bathing costumes. Other towns are invited to join in the processions and the competitions, and, as there is a Surf Club in every seaside resort around Sydney, the crowd is always a goodly sized one. There is keen competitions amoungst the various clubs as to the best breaker shooters and life-saving teams. The Rules and Regulations of the Surfare arranged by the Surf Club, and each club has its own life-saving team, composed as follows: belt-man, line-men and two reel-hands. When a person is seen in difficulties in the water, one of the team swims out to his assistance, and supports the victim until the belt-man, who is provided with a life-belt to which is attached a light line on a reel, reaches them; then belt-man then takes the victim and, by holding up one hand, gives the signal for the reel-men to wind in the line, thus drawing them speedily on to the shore. The teams are all instructed in First Aid to the Drowning, and, if the victim needs it, he is treated with first aid. Many lives every year are saved by these teams, three or four cases a day not being unusual. At Manly there is always a greatday when the Carnival is on, crowds of people from miles around coming to see the sports. 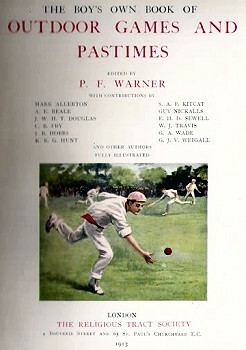 The programme of sports commences with life-saving displays by the various clubs' teams, the winning team being the one that rescues its man in the least time; next, generally, follows shooting the breakers, the prize being awarded to the person who takes the longest shoot and does it in the neatest style; then follows swimming races of one hundred or two hundred yards - longer distances would not be safe on account of the sharks that infest this coast. Although there has never been a bather taken by a shark in Manly, there have been some taken a little farther up the coast, and sharks have ben seen at Manly. When a shark is spotted, every bather is ordered out of the water immediately, althoiugh they do not generally require much ordering out, mostbeing only too pleased to be on dry land again. Bathers who swimm out any great distance are nicknamed "shark-baits." There is a later display by the club's surfboat. The boat is flat-bottomed and manned by half a dozen men. It is rowed out past the line of breakers, turned around facing the shore, and the rowers then wait to catch a good wave and come right to shore. This boat takes some navigating, for very often a wave cathes her broadside on, and over she goes. ... owing to the mild climate in the winter, some swimmers not missing a single morning all the year. In the summer there are as many people in the water in the night-time as in the day. It is common occurrence to see families on a fine moonlight night making their way down to the beach to spend an hour or so in the sea. Of the different styles of swimming perhaps the "trudgeon" and "crawl" strokes are the most popular; very seldom is the "breast" or "side" stroke used. One thing very noticeable about the "surfers" is how brown they are through the sun. Most people after coming out of the sea will have what is known as a "sunbake." They will lie in the sun with just their swimming costumes on for hours at a time, and there are a lot of boys who, but for their fair hair, would be taken for black men. The Australian boy is very proud of being sunburnt and browned, and will smear himself with cocoa-nut oil before lying in the sun, as this oil makes the skin brown and prevents the body from peeling. It does not take very many bakings with cocoa-nut oil to make the skin brown. At the Surf carnivals there is always a competition for sunburnt boys called the "Brown Man Competition," at which a prize is given to the boy who has the brownest skin. There are no bathing machines in Australia as there are in England, permanent dressing sheds being generally provided by the town council, and every comfort in the shape of shower baths, etc., is provided for the public by the authorities. 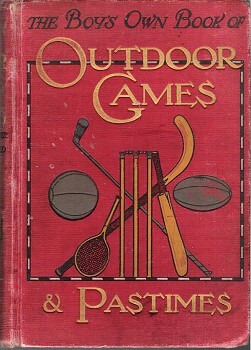 The Boy's Own Book of of Outdoor Games and Pastimes. Geoff Cater (2010) : H. S. Abbott : Surfing in Australia, 1913.